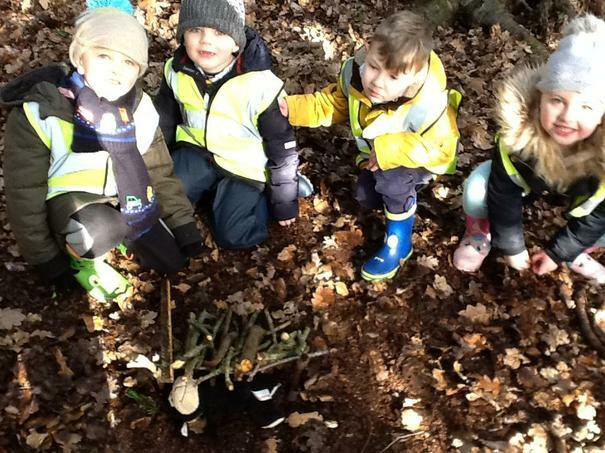 At Croft Infant School, Forest School is a child led programme that allows the child to explore, experience and appreciate the outdoor world through play and practical activities. 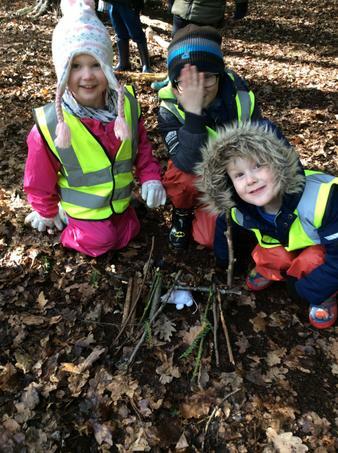 The planned sessions and activities provided by the Forest School leader are a direct result of the interests shown by the children during each session. 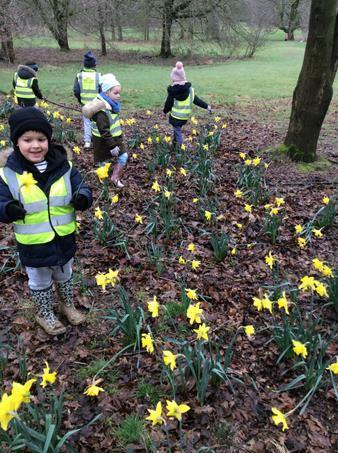 The children experience the natural world whatever the weather and so can learn and appreciate the seasonal changes and how the environment changes over time. 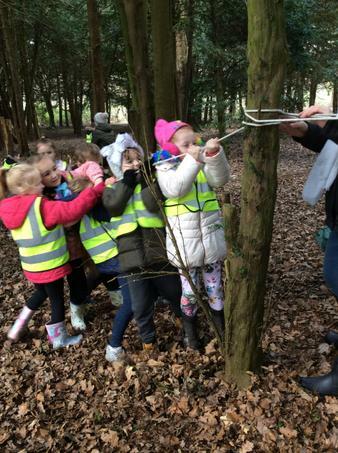 Sessions provide opportunities for children to develop their communication, speaking, listening and team building skills alongside increasing their knowledge of the natural world and learning about trees, mammals, plants and birds. 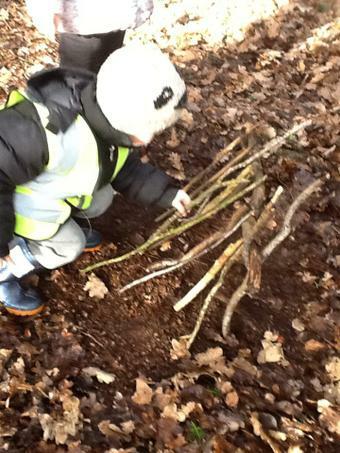 For our Forest School sessions we use the woodland at Alfreton Park. 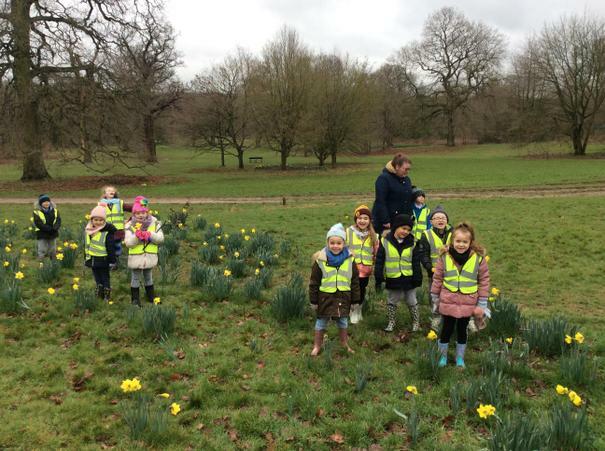 The park offers a range of different areas including a coniferous woodland, broadleaved trees and field areas. 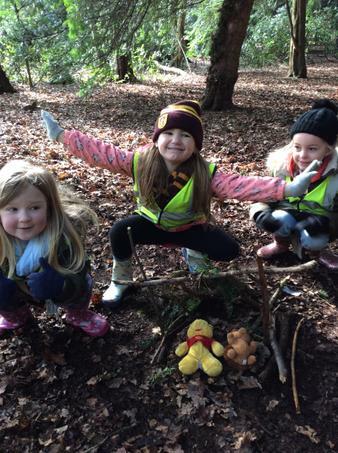 During Forest School sessions we aim to teach and involve children in the caring and sustaining of the woodland environment including minimising the impact of activities on the site. 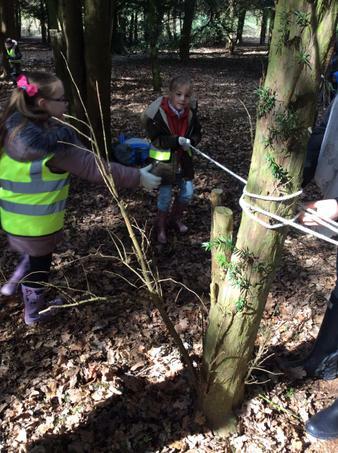 We have started to learn how to build our own shelters using tarpaulin and ropes. 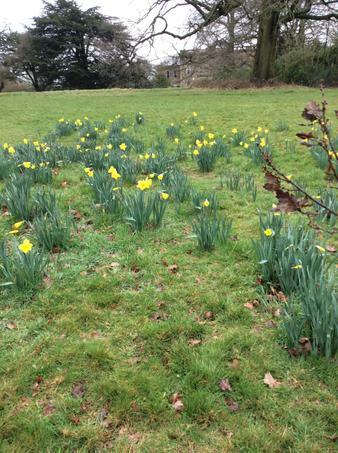 We have been searching for signs of Spring! 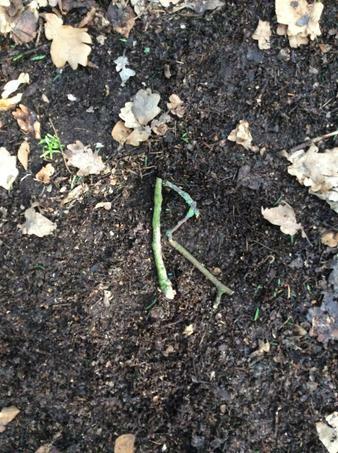 We used to sticks to make the initials of our first name! 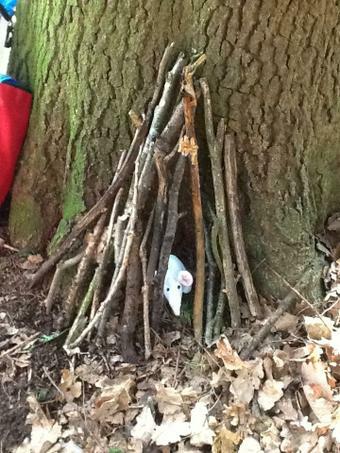 This time we learned how to make tipi shelters. 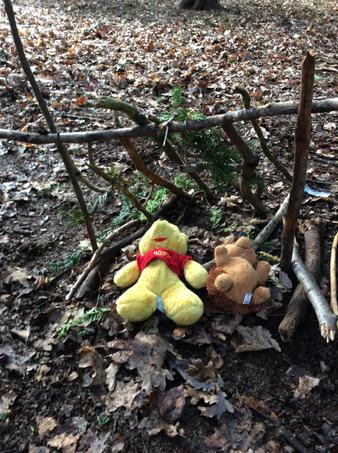 We learned about 'lean to' shelters and built them to protect the teddies from the cold wind! 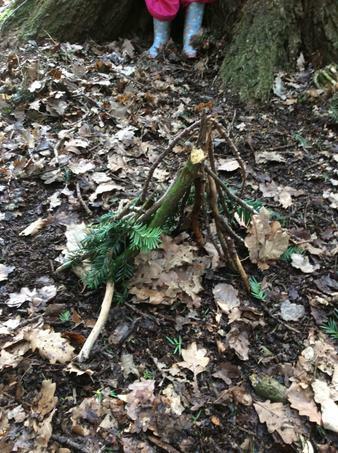 We built and 'lit' a pretend fire. 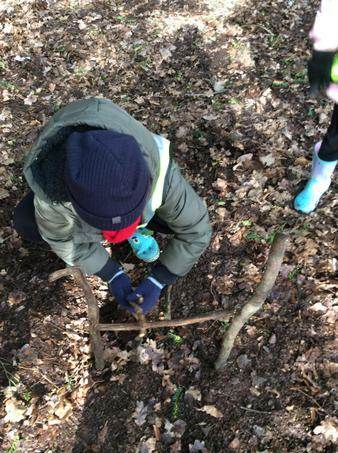 We compared leaves and branches from different trees and talked about how broad leaved trees such as oak trees lose their leaves in the autumn whereas coniferous trees, such as pine trees, lose a few leaves (or needles) throughout the year. This earns them their name 'evergreen' trees. 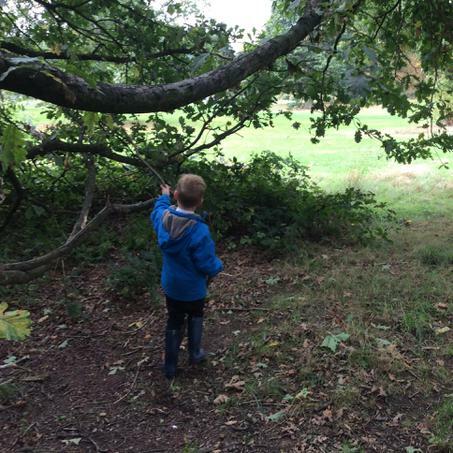 We had fun exploring the park. 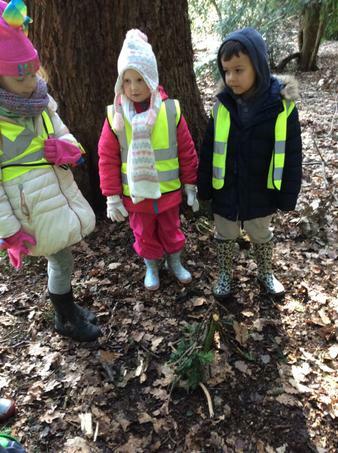 We found horse hoof prints in the mud! 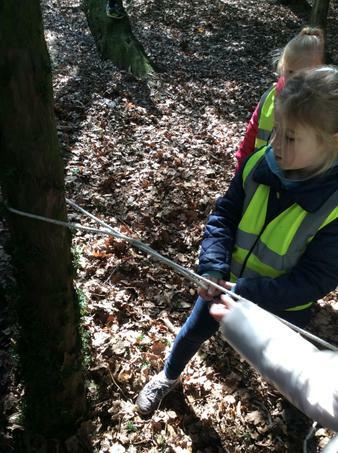 We measured the trunk width of an enormous horse chestnut tree! We got muddy from jumping in big puddles! 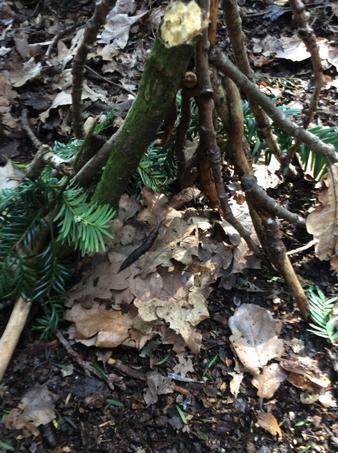 We built mini tipi and lean to shelters. 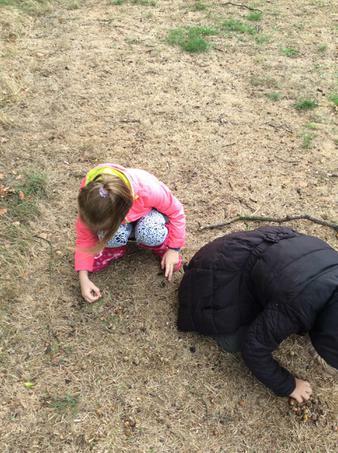 We explored the difference in the ground today compared to how it usually looks. The normally squishy mud was frozen today! We taught each other how to make snowballs and then had a fun snowball fight! 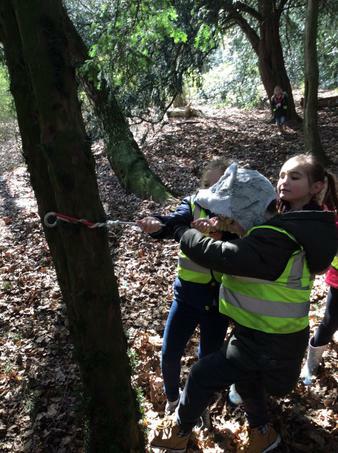 We had fun tree climbing! 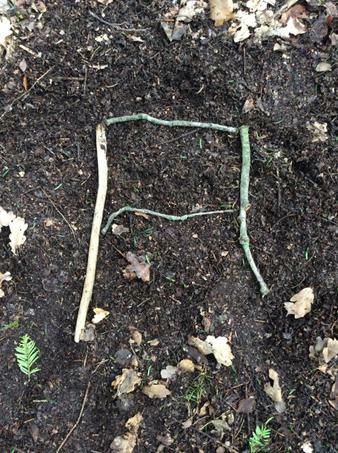 Today all of Blue Class joined us for our Forest School session! 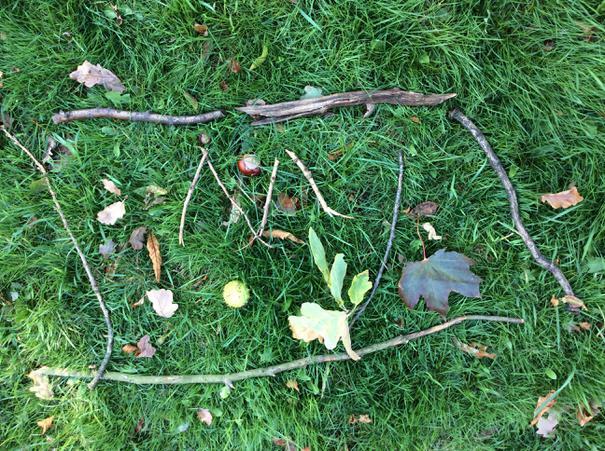 We were busy making leaf woodland creatures out of different leaves, sticks and other natural things we found in the woodland! 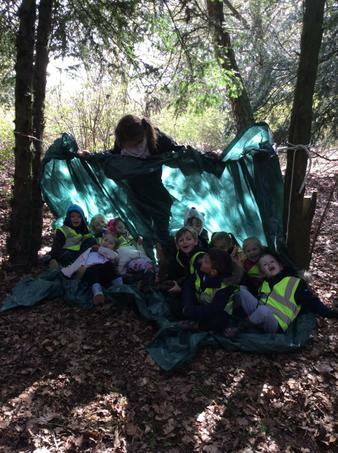 We enjoyed playing hide and seek! 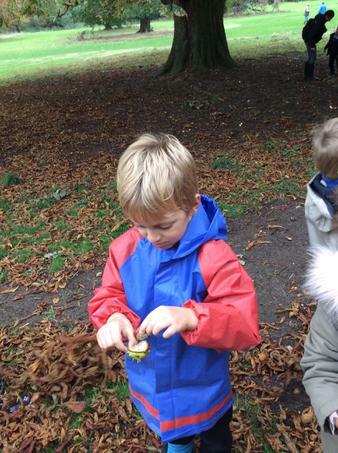 We read and ordered numbers from 1 - 12, then found and counted out that many natural objects we found in the woodland. 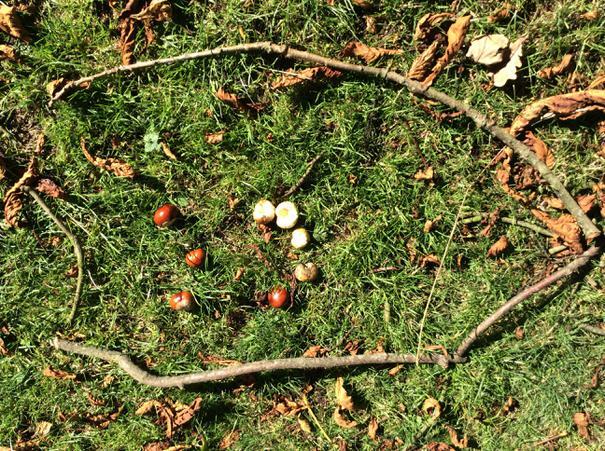 We played a memory game with natural objects found in the woodland including a stick, a piece of bark, a berry, a conker, a branch and a leaf. We took it in turns to remove an object and everyone else had to guess which object was missing! 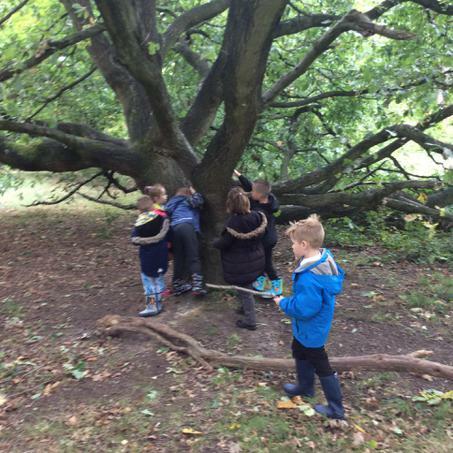 We measured a huge Horse Chestnut tree with our arms, and then stood in a circle to show how big the tree trunk was! We all framed our own flour hand print art! A tree patterned like a tiger! 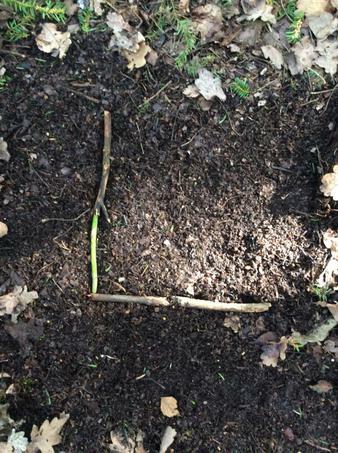 We found mole hills today! 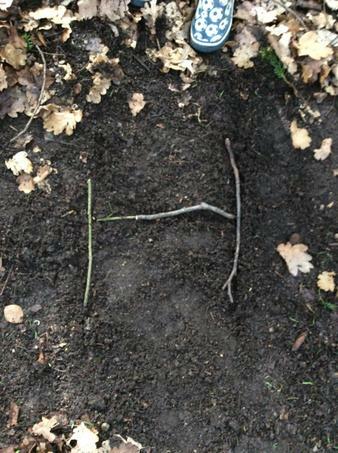 We talked about moles digging tunnels underground and we followed the molehills across the field. 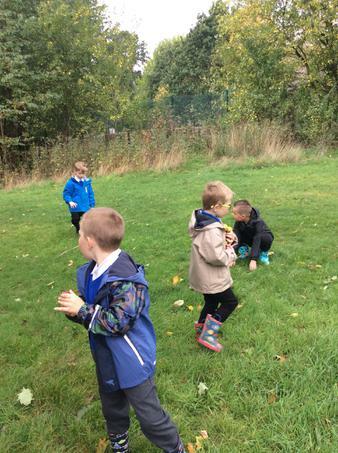 We enjoyed running up and down a huge hill! 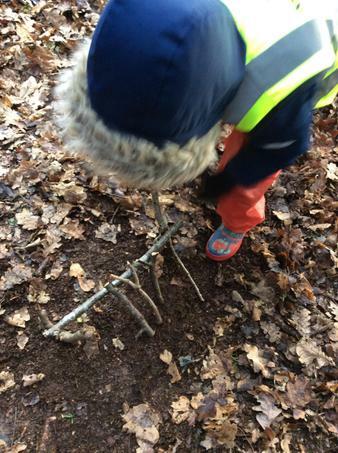 We compared sticks from longest to shortest. We talked about different words for 'long' and 'short' including 'big', 'small' and 'tall'. Who found the smallest leaf?? We talked about different words for small including tiny, teeny and mini. 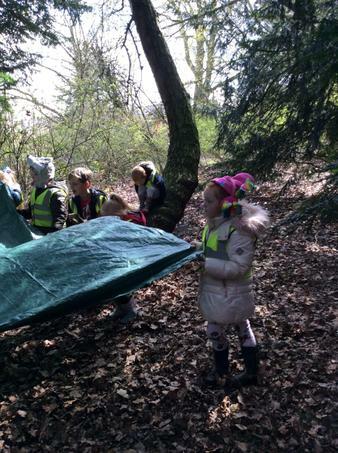 Who found the biggest leaf?? We thought of different words for big including massive and huge! 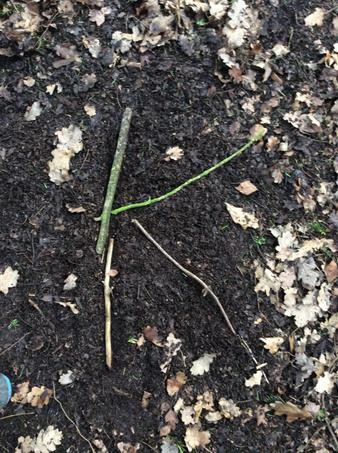 We found moss growing in the woodland. 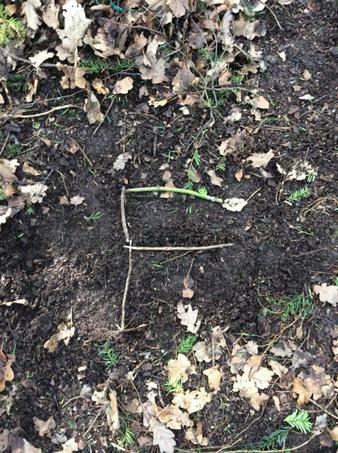 We touched it with our hands and used adjectives to describe it. 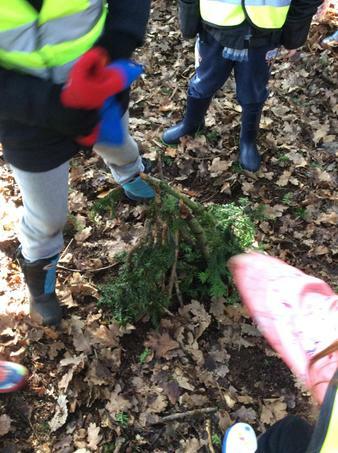 The children described the moss as 'soft' and 'fluffy'. 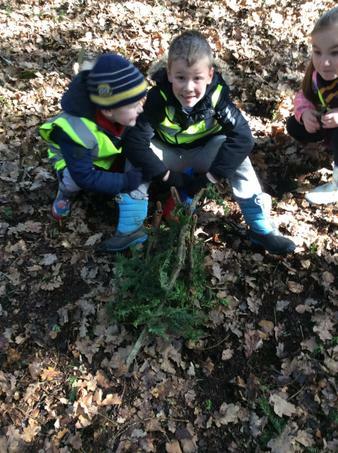 We noticed lots more moss growing as we explored the rest of the woodland during our sessions. 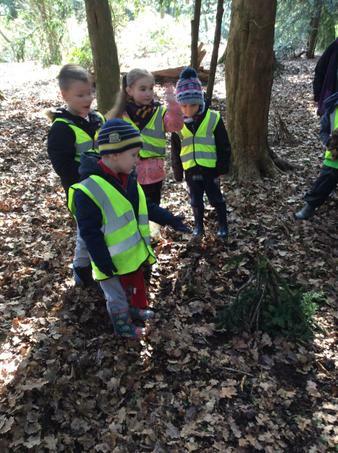 We learned about evergreen trees in our woodland where there are coniferous trees that do not lose their leaves all at once in autumn like other trees. 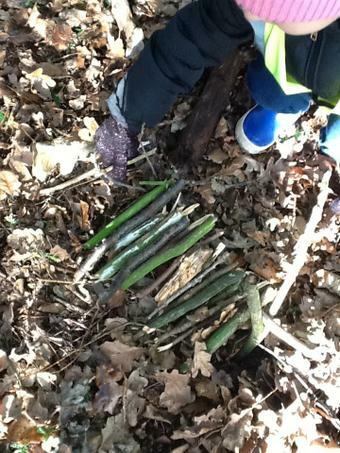 We felt the leaves/ needles and discovered that they felt quite soft. 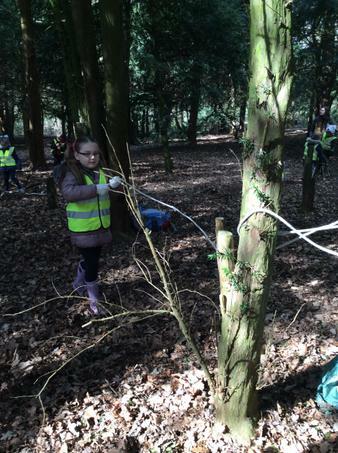 We measured the width of oak trees' trunks with our arms! 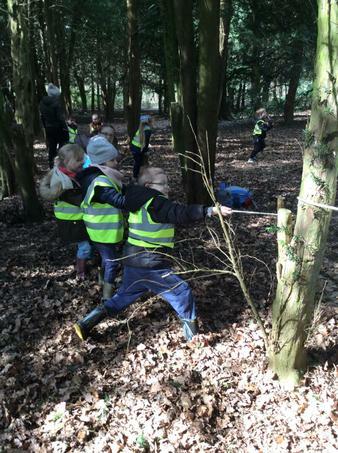 We learned to climb and balance on the low branches of trees. 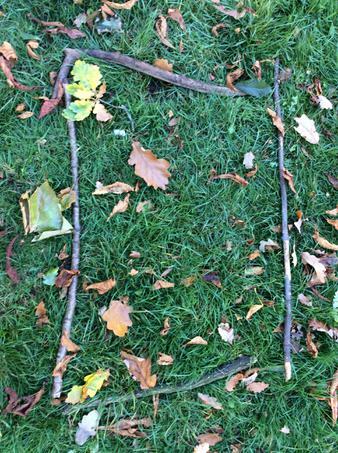 We matched leaves from underneath different trees to see if they were from the same tree. We had fun climbing up into trees. 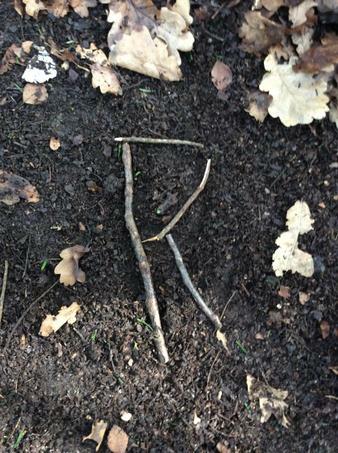 We used different sticks and branches to hit against other branches and trees to investigate the different sounds they made. 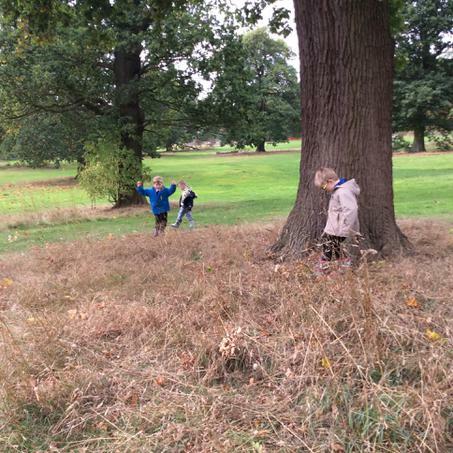 Today we played hide and seek! Can you see any of us?? 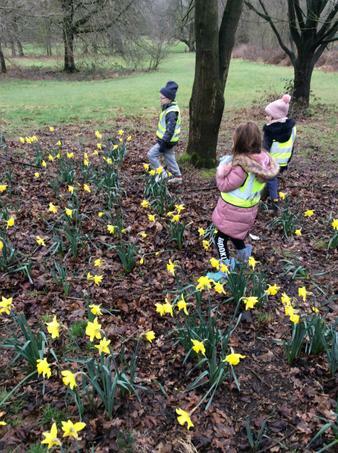 The children were asked to find different coloured leaves and we practised saying the names of the colours in the different languages that some of the children speak. We learned that in Polish brown is 'brązowy', green is 'Zielony' and yellow is 'żółty'! 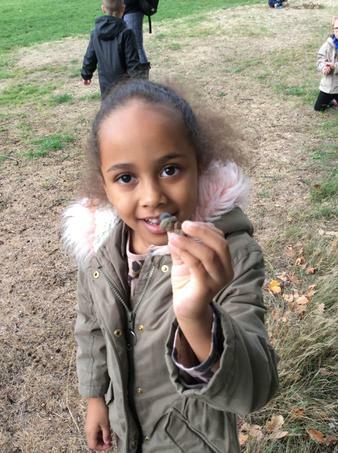 We looked at (but didn't touch) fungi that we found out in the field. 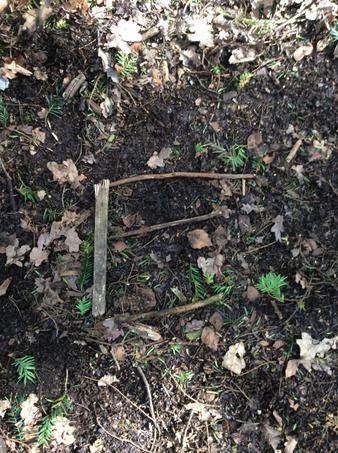 We had a stick throwing competition! 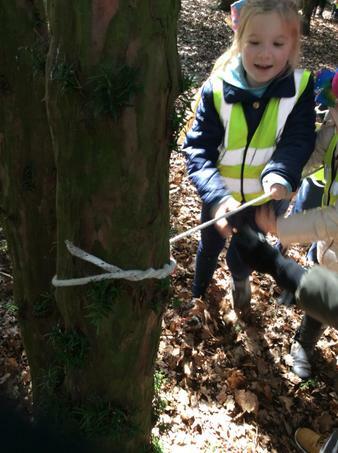 We have made bark rubbings on different trees. 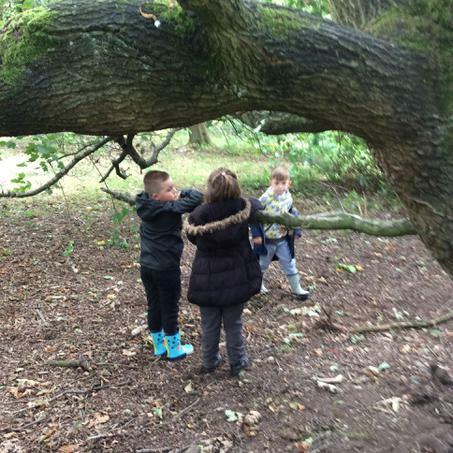 We practised climbing trees safely! 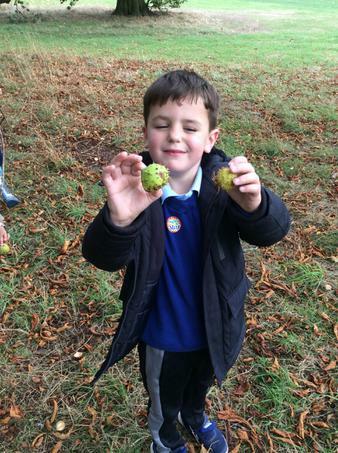 We found conkers that had been nibbled by squirrels! We painted natural objects with different coloured paint. We learned that if white paint is added to paint the colour becomes lighter, and adding black paint makes the colour darker. 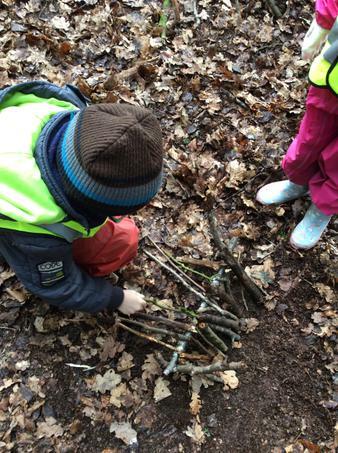 We chose sticks and ordered them from tallest to shortest! 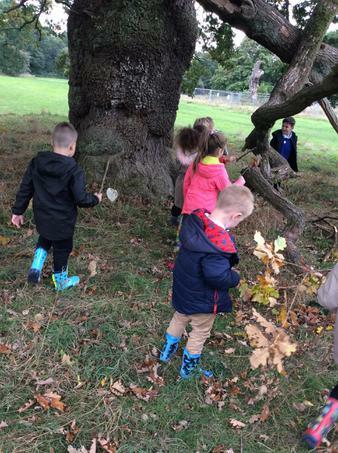 We had fun climbing a big oak tree! 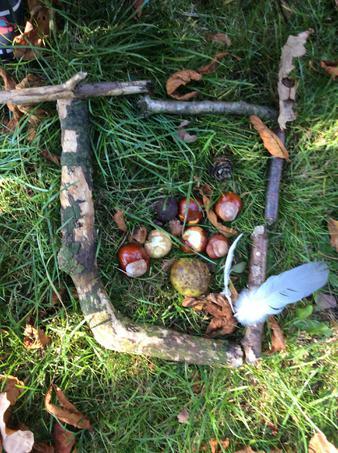 We all created our own nature 'photo frame'using natural objects we found around us including conkers, leaves, feathers and pine cones. 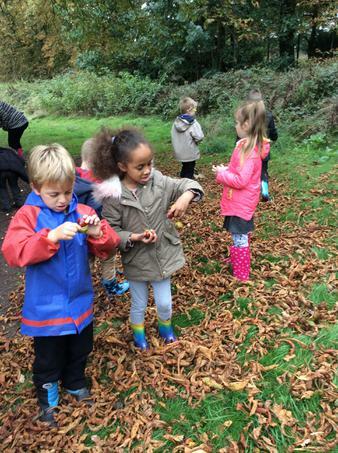 We could hear birds in the trees above us and saw squirrels running across the woodland floor and climbing up into the trees and they kept throwing half chewed conkers on our heads! 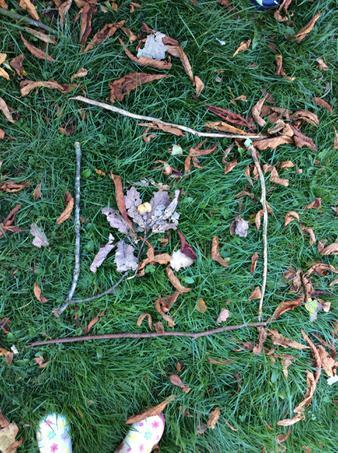 We talked about the differences of light in the woodland compared to in the field area by looking above us. 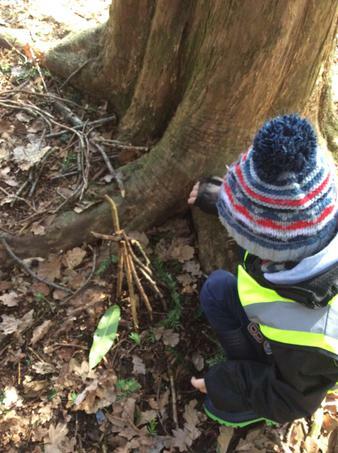 We have been busy finding natural woodland objects and describing them. 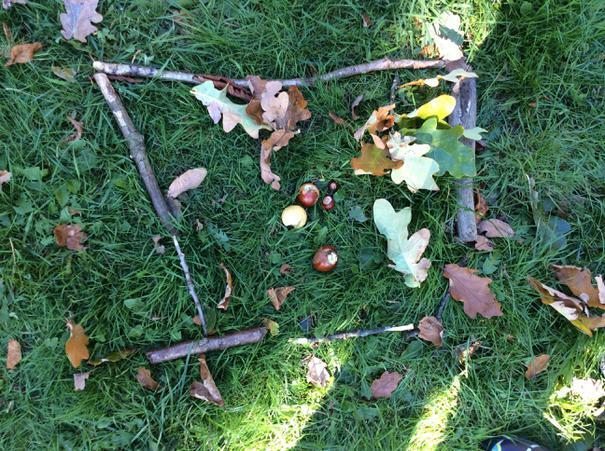 We found crunchy objects, smooth objects, soft objects and hard objects. 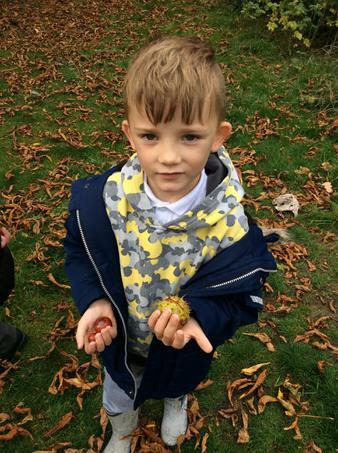 We searched across the fields and under the trees to find conkers and acorns. 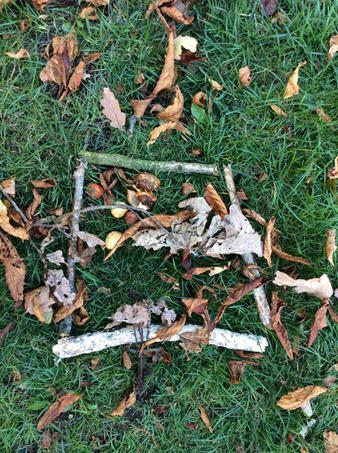 We collected different objects including sticks, conkers, leaves, acorns and branches to show our friends back at school. We enjoyed our hot chocolate and biscuit snack!